As a kid, I remember my dream job was “Spider-Man”. Some wanted to be police officers, other wanted to be lawyers or doctors, and some wanted to be marine biologists specialized in whale migration. But whenever the teacher asked: “What do you wanna be when you grow up, Alex?” I would always answer with confidence and self-assurance: “superhero”. I wanted to be a mutated combination of Spider-man and Super-Man. I don’t really know why, I guess I was extremely power hungry at 8 and wanted to rule the schoolyard with an iron fist spreading fear into my enemies, or more likely I just wanted to have awesome abilities. Unfortunately, for every year that passes, it seems less and less likely that I will get bitten by a radioactive spider, be called upon by a magic ring, or in the case of Marvel hero “Free Spirit”, getting exposed to radioactive self-help tapes (seriously, google it.) Yeah, I suppose, I have to fall back on my backup plan: getting called to Hogwarts and become the next teacher in Defense Against the Dark Arts. Well, since I am Scandinavian my local school would be Durmstrang and I am honestly okay with that too. 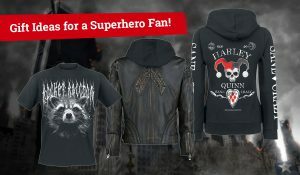 Alex’s 7 best gift ideas for a superhero/supervillain fan! Sometimes after a long day of locking up The Joker or getting into a battle of wits with The Riddler, even Batman likes to relax, and I like to imagine that his ego is so big that he wears a robe with the famous bat symbol on its back, and a cool bat hood in case he needs to get up in a hurry. The robe is super comfortable and is perfect for those lazy mornings. 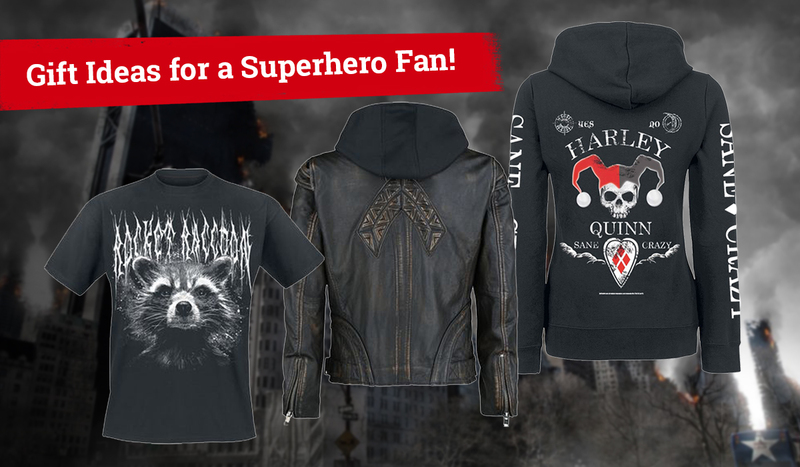 Throw in some of our Batman slippers, and you will never want to wear anything else. 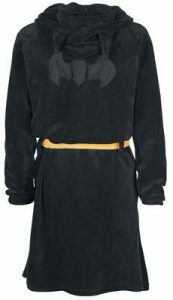 It’s literally the perfect bathrobe, or should I say “batrobe”? 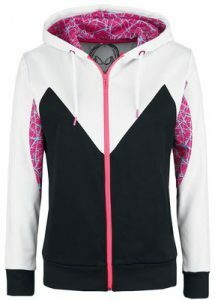 Spider Gwen came onto the superhero stage fairly recently making her debut in the excellent 2014 Spiderverse storyline. Spider-Gwen explores an alternative universe where Peter Parker’s tragic love-interest Gwen Stacy gets bitten by a radioactive spider instead of Peter, turning her into Spider-Woman. I remember when I first got introduced to her I immediately loved her; she is cool, plays drums in “The Mary Janes”, her costume design is amazing and the plots are intriguing. 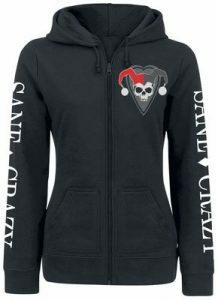 Goes without saying that she has become one of my personal favorite heroes, and therefore I love this hoodie. 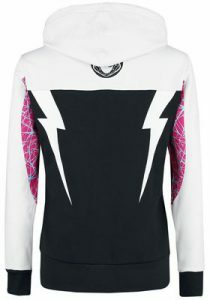 Spider-Gwen’s unique costume has made reoccurring appearances on multiple Comic-Cons with good reason it has a brilliant pink/white color scheme that looks extremely cool, and with the animated film “Into The Spider-verse” hitting the cinema December 12th, she is guaranteed to just keep surging in popularity. Unless you have been living under a rock, or have seriously no interest in superheroes (in that case I wonder how you ended up here? And how is the internet connection under that rock?) you know that DC’s the Aquaman movie is out in December, showing the story and royal lineage of the often misunderstood Arthur Curry. Aquaman has often been represented by media as the boring useless hero, but he is really awesome! 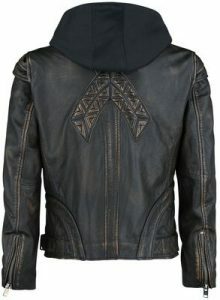 And so is this jacket! Surprisingly well-made, and stylish. The Aquaman logo is there but floats perfectly into the rest of the design. People outside the superhero/nerd world wouldn’t even think twice if they saw it. 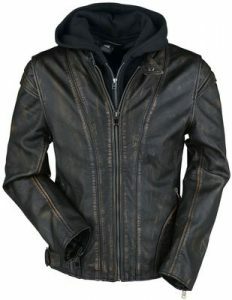 Unfortunately, it’s not vegan leather… but nevertheless a cool jacket that I personally love. Deadpool used to be an obscure wisecracking merch up until Ryan Reynolds leaked… I mean someone else we obviously don’t know who… leaked the Deadpool test-footage 4 years ago and he has since become a hilarious household name. His movies have become huge successes even with a PG-13 edited version of “Deadpool 2” “Once Upon A Deadpool” hitting cinemas December 12th. I might not be as brutal as the original but I am sure it will be a blast regardless considering DP’s quick wits. And quick wit is what you also get with this doormat, who welcomes your guests in the best way possible, while reminding them to wipe their feet. Dr. Harleen Frances Quinzel, better known as The Jokers partner in crime “Harley Quinn”, is a villain I’ve never felt gets enough justice in the movies: in reality (well comics) she is hilarious, her story is heart aching, a great fighter and capable of impressive acrobatics. She is so much more than DC’s less known clown and that’s why I love her. 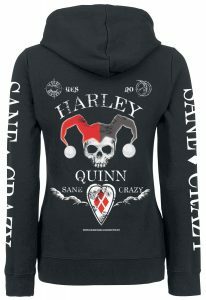 This zip hoodie has got an awesome “Skull Harley” design and have clearly taken inspiration from an Ouija board creating this “Cool girl look”. I think it looks awesome. If you don’t then fine – I am not your supervisor and you just have to live with being wrong. If someone said to me in 2012 that Guardians Of The Galaxy would be a major blockbuster, I would get them thrown into a mental institution for severe disillusions… but here we are! The movies are truly great; they are actually so great that they changed the comics. Peter Quill in the original Guardians Of The Galaxy was not the wisecracking vagabond we know today. But after the success of Chris Pratt’s portrayal they changed him to be more familiar to new readers, and honestly it was a welcomed change. My personal favorite on the crew, however, is Rocket, the destructive rodent voiced by Bradley Cooper fills my heart with joy. 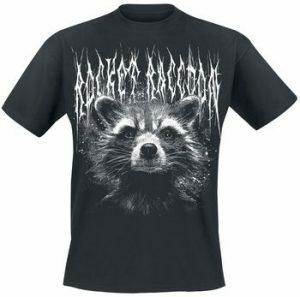 And so does this black metal inspired T-shirt that fills in the gap between Black metal logos and Marvel merch, and it works way better than it probably should. 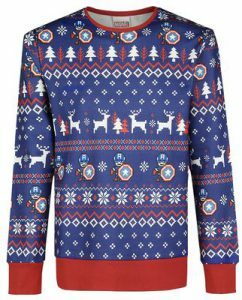 No Christmas list would be complete without an ugly Christmas Jumpers, and to be honest I never liked Captain America when he was introduced to the Marvel Cinematic Universe but he has really grown on me and as a consequence so has this jumper. I love the color scheme and the small “8-bit” Steve Rogers dancing around the entire jumper ready for battle with his shield. Perfect for that lazy boxing day, where all you wanna do is lay down and digest food. So there you have it! My personal 7 recommendations for stuff you can pick up for your friendly neighborhood superhero fan. It isn’t as good as the ability to eat almost any matter regardless of form (once again, no joke… “Matter-eater lad”) but it helps to fill the void. Now I am back to waiting for my summoning to the Durmstrang Institute but until then I will be enjoying muggle traditions and I hope that you will too. Merry Christmas and Happy Holidays. P.S: If anyone knows where I can get a radioactive spider I would much appreciate a heads-up.